The S. Pellegrino Fashion Food Event is a sight to behold if you have never attended. This year the 9th edition will take over the Cinquantenaire on 24 and 25th of April and will pay special attention to the Italian and Seafood cuisine. 10 open kitchens manned by chefs of famous restaurants such as Bocconi, Jaloa, Quincaillerie, etc. prepare special dishes, the guests pick and choose at leisure. Martin’s Hotels opens the latest in a line of great hotels in May of this year: the Patershof in the city of Malines. Situated in an old church, the 79 unique rooms are a first in Belgium! The spirit of the venue has been respected and visitors will still be able to admire the original features of the church. 3 modular meeting rooms for up to 50 people make it an ‘inspirational’ venue for your meetings. Here are some other holy MICE venues. The 60-room Kruisherenhotel-Maastricht is a renovated 15th century monastery of the Crutched Friars. The complex consists of the original monastery as well as a Gothic church, which houses the reception area and several hotel facilities, including conference rooms, a library, a boutique, and a coffee bar. Kruisheren hotel is a member of Design Hotels. A listed building dating from the 16th century. The Klooster has 40 rooms. The rooms exude a harmony and balance in keeping with the century-old history of this magnificent building. We cannot ignore the crisis and it goes without saying that media such as BBT Online, who emphasize honest reporting above advertising, also suffer and need the support of their loyal readers. Join the Club BBT Online and be the first to receive 6 online magazines and 25 Take 5 newsletters per year and stay informed about the latest news on venues, people, happenings, lifestyle, etc. For to make this happen, we need your support! Membership also entitles planners to priority registration for BBT Events such as famtrips, special events, workshops etc..
Last but not least, membership (valid for 1 year from date of joining) entitles suppliers to special negotiated rates for advertising with BBT Online. All this and more for only €45 per year! Join and support BBT Online; be a winner in dark times!! BBT Online is putting a group of 15 Hosted Buyers from Belgium, Holland, France and Germany together to visit the 17th Incentive Travel & Conventions, Meetings Asia Fair, 6 – 8 October 2009 in Bangkok. IT&CMA offers a complimentary round trip economy ticket plus 5 nights of hotel stay. A first stage we would like you to contact us at info@bbtonline.eu if you are interested in joining us for this trade fair experience. Participants will be invited to join on a first come, first serve basis, so do not wait too long and register your interest today! The Mille Miglia Race in Italy is a great classic, the longest race for oldtimers in the world who take 3 days to race from Brescia to Roma and back. A unique opportunity to see one of the finest collections of cars built between 1927 and 1957 in action along the beautiful Italian countryside. Events & tax deductible, what to know…? Brussels Meeting Week Awards: and the winners are…. At the conclusion of the Brussels Meeting Week (20th of March), the annual tourism awards were distributed to the 9 initiatives that contributed most in 2008 to the development of the dynamic image of Brussels. Touristic event for 2008: Expo This is your Earth! 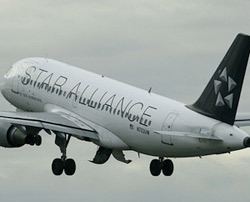 Star Alliance has launched the Star Alliance Academy for Travel Experts in Belgium. In collaboration with the University of Breda they have developed 4 x 2-day sessions during which they will cover topics such as the aviation market, business travel management, airport management and airline economics. The first session takes place on May 7-8th, with further sessions planned for June, September and November. The programme is sponsored by Brussels Airport and Novotel. The classes are a mix of theoretical and practical exercises and are taught in English. “Our welcome is warmer than our weather” the local saying goes, this book explains why. The fourth edition of the definitive guide to the great city of Ghent, an absolute must, even for those who know the town! The Dacha experience and the best of Russian cuisine, definitely an original way of getting to know more about Russia! Can Women rescue the economy? JUMP is the biggest event dedicated to professional active Women, their career planning and their position in the economy. The first 2 JUMP Forums dedicated to career minded Women were held in Brussels gathered some 1400 participants each. This year JUMP – 23rd April in Brussels! - is focusing on the dramatic economic situation by highlighting the economic incentive behind empowering Women. Learn how to increase your company’s performance and how Women in general can renew the economy. For more information, go to http://mailing.isamedia.net Simple, you take over the Spa as proposed by Dolce La Hulpe Brussels for the brand new spa Les Cinq Mondes. For groups up to 45 persons, Cinq Mondes proposes a formula that splits up the group in 3; whilst the first group is enjoying a choice of treatments, the other groups are attending initiatio n classes in Tai-chi or Yoga, an ideal half or full day “Zen” experience in the beautiful wooded site of Dolce La Hulpe. London is getting ready for 2012! Brook Green UK has prepared an exciting treasure hunt challenge, including some of the future Olympic sites. The challenge ends with lunch at a fabulous restaurant overlooking the Olympic Stadium. The event has been designed to inspire a spirit of teamwork, co-operation, motivation and a large dose of fun. The hunt takes in the great landmarks and culture of London while solving cryptic and photographic clues, in order to find the spy. Teams will be provided with a camera in order to complete their challenges, questions will get brains ticking. Starting locations are sent to the teams via USB stick in advance, or top secret dossier delivered to their hotel rooms. Challenges can be adapted to any group size and requirement, and can be personalized to specific company needs. The London James Bond treasure hunt brings out exuberance and enthusiasm in all participants. Complete the challenges, answer the James Bond themed questions and beat opposing teams to the end location! The hunt takes place in London, focusing on notable landmarks associated with James Bond, while answering themed questions and completing photo challenges. Along the way, teams will encounter a top secret spy colleague and an informant. Have a look at this short movie to get an idea! The Good Time Company is introducing an innovative, cost-effective, and exciting incentive product in Belgium, based on the legendary and mythical 2CV! 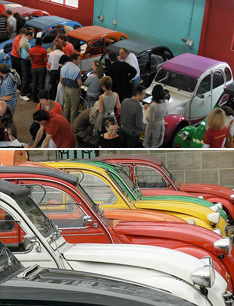 Many of us have good and mostly funny memories of excursions in the ‘ugly duckling’ and therefore discovering the picturesque countryside of Belgium at the wheel of a 2CV and with many original and fun activities along the way will definitely be an original and creative day out for your team! It has been proven that people who take efficient relaxation pauses, work more efficiently the rest of the day. The Relaxcompany offers a wide variety of efficient relaxation moments in your office or at your meetings. www.relaxcompany.be for details and programs. On April 30th every year the Dutch go crazy when celebrating the birthday of the Queen. Every city, town or village organizes parties and events. Especially Amsterdam is worth visiting on that day. For more details, go to www.koninginnedagamsterdam.nl In November the well known concept Night of The Proms will also be performing in Holland (Arnhem & Rotterdam) and, just as in Belgium, they represent a great opportunity for corporate entertainment with VIP packages available for all concerts. MPI International have just announced that President Elect for 2009-2010 is Eric Rozenberg, CMP, CMM, President, Ince&Tive, Brussels, Belgium. Dolce Hotels & Resorts announces the appointment of Thibault Ruffat (39) as Vice-President Sales Europe, based in Paris. Meetingselect in Holland has expanded their team to be able to meet the growing demand in meeting management. As per 1st of March Vanessa Huisman has started at Meetingselect in the position of Senior Consultant. Looking for a new colleague for your team? BBT Online is read by all the professionals in the business. For the modest sum of Eur 50 we post your 3 –line profile, no need to advertise your name, each profile is assigned a reference number, applications are funneled through BBT Online straight to you! Looking for a new challenge? Read this column every fortnight and if you see the description that looks like made for you, send us your CV + picture + letter of motivation AND the reference number of the job offer to info@bbtonline.eu, we’ll pass it on to the relevant company! • MPI starts crisis website: MPI started a new website www.MeetingIndustryCrisisCenter.org as a reaction to the recent developments in the United States where companies in trouble who secured an emergency loan from the government now have to have all budgets with regards to meetings, events and incentive programs approved prior to booking! • The 511-room Sheraton Brussels was sold to International Real Estate Plc (IRE) with CBRE Hotels acting as exclusive sole selling agents for Starwood Hotels & Resorts throughout the process. A new long term management agreement has been signed with Starwood Hotels & Resorts and the hotel will continue to operate under the Sheraton brand. • Thai Airways International announced that since 29th March 2009, THAI will operate ALL domestic flights from BKK Suvarnabhumi airport. • Best Western Premier Carrefour de l’Europe, located 50 m from the Brussels’ Grand’Place has been totally renovated. • March 30th sees the start of the asparagus festival at the 9 Belgian Novotel hotels in the restaurant “Foodsquare”. • 16th of April = Secretary Day!! • HelmsBriscoe, the global leader of independent site selection and RFP services for the meetings business, announced the addition of the 1000th associate to its network. • 52% of the European hotel managers don’t expect a recovery of the economic situation before 2011. • The new dates of AIME 2010, 18th Asia-Pacific Incentives & Meetings Expo, will be 2-3 March not 27-28 April as previously advised. • 34% of the Germans likes to flirt during their flight (Belgiums, 13%). 7% of Swedish frequent travelers are ‘member’ of the ‘Mile High Club’. Source British Airways. • Until April 14th Thalys proposes its clients tickets at ½ price of the Hi-Life tariff. The offer is valid in Comfort 1 and Comfort 2 for trips between April 15th and June 28th. • Guy Verbist of BCD Travel was promoted to vice president for the Benelux. • From April 4 till 12, 10 chocolate artists will present giant Easter eggs in the leafy décor of the Dolce La Hulpe Brussels. On April 12th there will be an Easter Brunch followed by an Easter egg chase. • Holland’s NBTC (Convention Bureau) launched the Amsterdam Mobile Guide on http://us.holland.com/mobile. Visitors to Amsterdam can now download free English language information on the Amsterdam highlights on their mobiles, iPhone and G1 included. There is also a free native application waiting for distribution via the Apple App Store.